The bobcat (Lynx rufus) is a North American cat that appeared during the Irvingtonian stage of around 1.8 million years ago (AEO). Containing 12 recognized subspecies, it ranges from southern Canada to central Mexico, including most of the contiguous United States. The bobcat is an adaptable predator that inhabits wooded areas, as well as semidesert, urban edge, forest edge, and swampland environments. It remains in some of its original range, but populations are vulnerable to local extinction ("extirpation") by coyotes and domestic animals. With a gray to brown coat, whiskered face, and black-tufted ears, the bobcat resembles the other species of the midsized Lynx genus. It is smaller on average than the Canada lynx, with which it shares parts of its range, but is about twice as large as the domestic cat. It has distinctive black bars on its forelegs and a black-tipped, stubby tail, from which it derives its name. 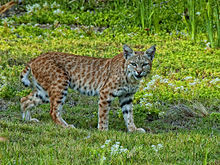 The bobcat resembles other species of the Lynx genus, but is on average the smallest of the four. Its coat is variable, though generally tan to grayish-brown, with black streaks on the body and dark bars on the forelegs and tail. Its spotted patterning acts as camouflage. The ears are black-tipped and pointed, with short, black tufts. Generally, an off-white color is seen on the lips, chin, and underparts. 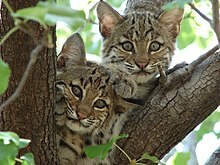 Bobcats in the desert regions of the southwest have the lightest-colored coats, while those in the northern, forested regions are darkest. Kittens are born well-furred and already have their spots. A few melanistic bobcats have been sighted and captured in Florida. They appear black, but may still exhibit a spot pattern. The bobcat is crepuscular. It keeps on the move from three hours before sunset until about midnight, and then again from before dawn until three hours after sunrise. Each night, it moves from 2 to 7 mi (3.2 to 11.3 km) along its habitual route. This behavior may vary seasonally, as bobcats become more diurnal during fall and winter in response to the activity of their prey, which are more active during the day in colder weather. Like most felines, the bobcat is largely solitary, but ranges often overlap. Unusual for cats, males are more tolerant of overlap, while females rarely wander into others' ranges. Given their smaller range sizes, two or more females may reside within a male's home range. When multiple male territories overlap, a dominance hierarchy is often established, resulting in the exclusion of some transients from favored areas. The bobcat is able to survive for long periods without food, but eats heavily when prey is abundant. During lean periods, it often preys on larger animals on which it can kill and return to feed later. The bobcat hunts by stalking its prey and then ambushing it with a short chase or pounce. Its preference is for mammals weighing about 1.5 to 12.5 lb (0.68 to 5.67 kg). Its main prey varies by region. In the eastern United States, it is the eastern cottontail species, and in the north it is the snowshoe hare. When these prey species exist together, as in New England, they are the primary food sources of the bobcat. In the far south, the rabbits and hares are sometimes replaced by cotton rats as the primary food source. Birds up to the size of a swan are also taken, along with their fledglings and eggs. The bobcat is an opportunistic predator that, unlike the more specialized Canada lynx, readily varies its prey selection. 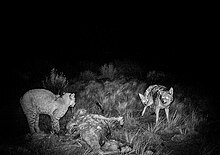 Diet diversification positively correlates to a decline in numbers of the bobcat's principal prey; the abundance of its main prey species is the main determinant of overall diet. 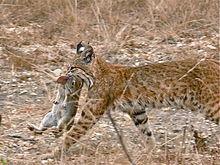 The bobcat hunts animals of different sizes, and adjusts its hunting techniques accordingly. With small animals, such as rodents (including squirrels), birds, fish including small sharks, and insects, it hunts in areas known to be abundant in prey, and will lie, crouch, or stand, and wait for victims to wander close. It then pounces, grabbing its prey with its sharp, retractable claws. For slightly larger animals, such as geese, rabbits, and hares, it stalks from cover and waits until prey comes within 20 to 35 ft (6.1 to 10.7 m) before rushing in to attack. Less commonly, it feeds on larger animals, such as young ungulates, and other carnivores, such as fishers (primarily female), foxes, minks, skunks, small dogs, and domesticated cats. Bobcats are considered the major predatory threat to the endangered whooping crane. Bobcats are also occasional hunters of livestock and poultry. While larger species, such as cattle and horses, are not known to be attacked, bobcats do present a threat to smaller ruminants, such as sheep and goats. According to the National Agricultural Statistics Service, bobcats killed 11,100 sheep in 2004, comprising 4.9% of all sheep predator deaths. However, some amount of bobcat predation may be misidentified, as bobcats have been known to scavenge on the remains of livestock kills by other animals. The adult bobcat has few predators other than humans, although it may be killed in interspecific conflict. Cougars and gray wolves can kill adult bobcats, a behavior repeatedly observed in Yellowstone National Park. Coyotes have killed adult bobcats and kittens. At least one confirmed observation of a bobcat and an American black bear (Ursus americanus) fighting over a carcass is confirmed. Bobcat remains have occasionally been found in the resting sites of male fishers. Kittens may be taken by several predators, including owls, eagles, foxes, coyotes, and bears, as well as other adult male bobcats; when prey populations are not abundant, fewer kittens are likely to reach adulthood. Golden eagles (Aquila chrysaetos) have been reportedly observed preying on bobcats. The historical range of the bobcat was from southern Canada, throughout the United States, and as far south as the Mexican state of Oaxaca, and it still persists across much of this area. In the 20th century, it was thought to have lost territory in the US Midwest and parts of the Northeast, including southern Minnesota, eastern South Dakota, and much of Missouri, mostly due to habitat changes from modern agricultural practices. While thought to no longer exist in western New York and Pennsylvania, multiple confirmed sightings of bobcats (including dead specimens) have been recently reported in New York's Southern Tier and in central New York. In addition, bobcat sightings have been confirmed in northern Indiana, and one was recently killed near Albion, Michigan. In early March, 2010, a bobcat was sighted (and later captured by animal control authorities) in a parking garage in downtown Houston. By 2010, bobcats appear to have recolonized many states, occurring in every state except Delaware. It is listed in Appendix II of the Convention on International Trade in Endangered Species of Wild Fauna and Flora (CITES), which means it is not considered threatened with extinction, but hunting and trading must be closely monitored. The animal is regulated in all three of its range countries, and is found in a number of protected areas of the United States, its principal territory. Estimates from the US Fish and Wildlife Service placed bobcat numbers between 700,000 and 1,500,000 in the US in 1988, with increased range and population density suggesting even greater numbers in subsequent years; for these reasons, the U.S. has petitioned CITES to remove the cat from Appendix II. Populations in Canada and Mexico remain stable and healthy. The IUCN lists it as a species of least concern, noting it is relatively widespread and abundant, but information from southern Mexico is poor. The species is considered endangered in Ohio, Indiana, and New Jersey. It was removed from the threatened list of Illinois in 1999 and of Iowa in 2003. In Pennsylvania, limited hunting and trapping are once again allowed, after having been banned from 1970 to 1999. The bobcat also suffered population decline in New Jersey at the turn of the 19th century, mainly because of commercial and agricultural developments causing habitat fragmentation; by 1972, the bobcat was given full legal protection, and was listed as endangered in the state in 1991. 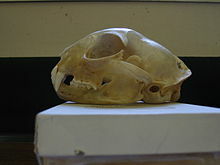 L. r. escuinipae, the subspecies found in Mexico, was for a time considered endangered by the US Fish and Wildlife Service, but was delisted in 2005. ^ IUCN (International Union for Conservation of Nature) 2008. Lynx rufus. In: IUCN 2014. The IUCN Red List of Threatened Species. Version 2014.3. http://www.iucnredlist.org. Downloaded on 25 February 2015. ^ a b Zielinski, William J; Kuceradate, Thomas E (1998). American Marten, Fisher, Lynx, and Wolverine: Survey Methods for Their Detection. DIANE Publishing. pp. 77–8. ISBN 0-7881-3628-3. ^ Johnson, W.E. ; Eizirik, E.; Pecon-Slattery, J.; Murphy, W.J. ; Antunes, A.; Teeling, E. & O'Brien, S.J. (2006). "The Late Miocene radiation of modern Felidae: A genetic assessment". Science. 311 (5757): 73–77. doi:10.1126/science.1122277. PMID 16400146. ^ Mills, L. Scott (November 2006). Conservation of Wildlife Populations: Demography, Genetics, and Management. Blackwell Publishing. p. 48. ISBN 1-4051-2146-7. ^ Wilson, Don E; Ruff, Sue (September 1999). The Smithsonian Book of North American Mammals. Smithsonian Institution Press. pp. 234–5. ISBN 1-56098-845-2. ^ IUCN Specialist Cat Group. "Revised taxonomy of the Felidae" (PDF). Cat News. Special Issue Nr 11: 76–77. ^ a b Sparano, Vin T (September 1998). Complete Outdoors Encyclopedia. St. Martin's Press. p. 228. ISBN 0-312-19190-1. ^ a b c d e McDowell, Robert L (April 2003). Endangered and Threatened Wildlife of New Jersey. Rutgers University Press. pp. 23–4, 27. ISBN 0-8135-3209-4. ^ a b c Fergus, Charles (2003-08-01). Wildlife of Virginia and Maryland Washington D.C. Stackpole Books. p. 119. ISBN 0-8117-2821-8. ^ "FieldGuides: Species Detail". eNature. Retrieved 2011-10-17. ^ a b c d e f g h i j Whitaker, John O; Hamilton, W J (1998-01-01). Mammals of the Eastern United States. Cornell University Press. pp. 493–6. ISBN 0-8014-3475-0. ^ a b Janečka, JE; TL Blankenship; DH Hirth; ME Tewes; CW Kilpatrick; LI Grassman Jr. (August 2006). "Kinship and social structure of Bobcats (Lynx rufus) inferred from microsatellite and radio-telemetry data". Journal of Zoology. 269 (4): 494–501. doi:10.1111/j.1469-7998.2006.00099.x. ^ a b c d e Feldhamer, George A; Thompson, Bruce C; Chapman, Joseph A (2004-01-01). Wild Mammals of North America. Johns Hopkins University Press. pp. 769–70. ISBN 0-8018-7416-5. ^ a b c Fischer, William C.; Miller, Melanie; Johnston, Cameron M.; Smith, Jane K. (1996-02-01). Fire Effects Information System. DIANE Publishing. p. 83. ISBN 0-7881-4568-1. ^ a b Nowak, Ronald M (April 1999). Walker's Mammals of the World. Johns Hopkins University Press. p. 809. ISBN 0-8018-5789-9. ^ "Bobcat". bcadventure.com. Interactive Broadcasting Corporation. Retrieved 2007-06-25. ^ Peterson, Roger Tory; Murie, Olaus Johan (1998-01-15). A Field Guide to Animal Tracks. Houghton Mifflin Field Guides. p. 115. ISBN 0-395-91094-3. ^ Fedriani, J. M.; Fuller, T. K.; Sauvajot R. M. & York, E. C. (2000). "Competition and intraguild predation among three sympatric carnivores". Oecologia. 125 (2): 258–270. doi:10.1007/s004420000448. PMID 24595837. ^ Gipson, P. S. & Kamler, J. F (2002). "Bobcat killed by coyote". Southwestern Naturalist. 47 (3): 511–514. doi:10.2307/3672519. ^ Knick, S. T. (1990). "Ecology of bobcats relative to exploitation and a prey decline in southeastern Idaho". Wildlife Monographs. 108: 1–42. JSTOR 3830671. ^ Hiestand, SJ. ; Nielsen, CK. ; Jiménez, FA. (2014). "Epizootic and zoonotic helminths of the bobcat (Lynx rufus) in Illinois and a comparison of its helminth component communities across the American Midwest". Parasite. 21: 4. doi:10.1051/parasite/2014005. PMC 3923260  . PMID 24521984. ^ "Rodenticide: Impacts and Alternatives". Urban Wildlife Research Project. Retrieved 5 August 2016. Sunquist, Melvin E; Fiona Sunquist (2002). Wild cats of the world. University of Chicago Press. pp. 185–197. ISBN 0-226-77999-8. This page was last edited 07:36, 14 June 2017 by Wikipedia anonymous user 195.101.67.42. Based on work by Wikipedia user Jdforrester (WMF) and Wikipedia anonymous users 94.113.149.200 and imported>G.weston1.